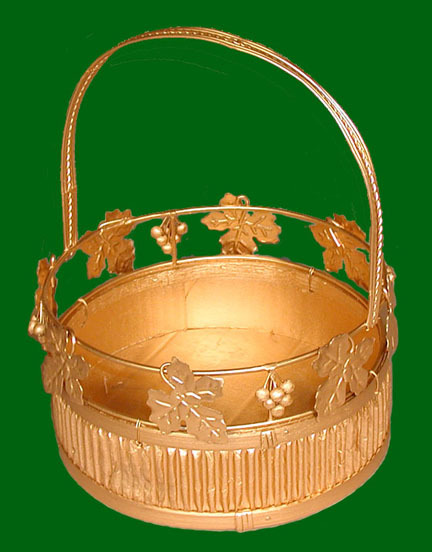 This round basket measures 8" in diameter, 10.5" tall to the top of the handle, 4.25" tall without measuring the handles. It is the leftover from a job over run. It is available only in Gold. It is on special. To qualify for direct import, you must purchase a mininum of one case in one color if your are a premier customer of ours (premier customer # required). If not, you must purchase a minimum of 8 cases of this item, or 25 cases of a variety of items in full case lots. If you are not interested in the full case quantity of this item, click here to go back to the Regular prices.